It was a crazy semester. That's really the only reason I have for my absence here. I hardly slept, let alone made any clothes. I had never worked so hard on anything until I worked on my Line Development homework--learning to draw, design, and put together cohesive lines of clothing. Getting a portfolio together, learning photoshop... it all required a lot of time and effort and I seriously pushed myself to my limits. It was so, so worth it--worth skipping other classes to finish projects, worth pretty much letting go of my social life, worth all the consecutive nights stayed up before projects were due, sitting for 24 hours in one spot, working nonstop. Because now that it's over, now that I'm home and can remember to eat normal meals, get a full nights sleep, and let go of the massive doses of caffeine, I can proudly look at my portfolio and know that it is a kind of quality I am proud to show potential employers, something I can bring to internship interviews. That I created something I'm proud of and loved doing it (for the most part) and know I'm still passionate about this--that's worth it, in the end. Oh, and I achieved a 4.0 GPA for the first time! That was pretty gratifying, too. I am sorry for any emails that went unanswered, attempts to contact me that were to no avail. I really let a lot of things go this fall. I'm playing catch-up, but if you tried to contact me and I didn't reply, do try again! This is a dress I made spontaneously on New Year's Eve. It was the first garment I'd made in months! I was sick of everything in my closet, and I'd happened to throw two table cloths on top of each other while cleaning my sewing room. One was a thrift store find from the summer, and the other I had dyed several years ago with the intent of making something eventually. After staring at them a little while, I decided I needed a new dress to wear that night. So I copied a pattern from the dress I posted pictures of on my birthday, and got to work right then. Four hours later, I had myself a new dress and a couple hours left to make some desserts for our annual party. It's really rather poorly thrown together on the inside--I didn't use seam finishes or anything--and the waist is a smidgen big on me. But it's fun and new and I'm okay if it doesn't last forever. I also made my cowl: it was a little exercise in maintaining sanity during the semester. My friends and I went out, bought yarn and needles, and just sat and knit to unwind. It worked! My New Year's Eve was lovely--food, music, friends, fun, and a bonfire, as usual! How was yours? What are your resolutions, if you made any? Hope your fall went well--tell me about it! This actually reminds me that I'd better try to get some nice photos of my costumes/handmade clothes this year. It will probably involve trying to find a friend to hijack as a photographer though. I love the dress, the subtle pattern in the skirt is to die for, it's wonderful! 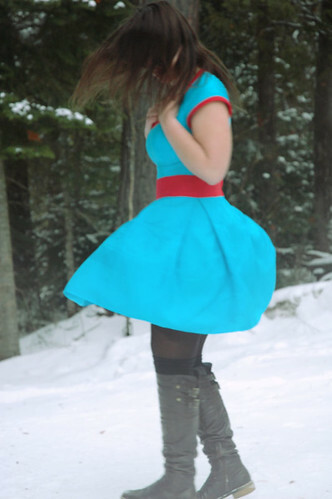 I agree about the contrast of the colourful dress with the snow, it looks fantastic. Three things. You are lovely, I can't wait to see you and I am so happy you blogged again! =)!!! 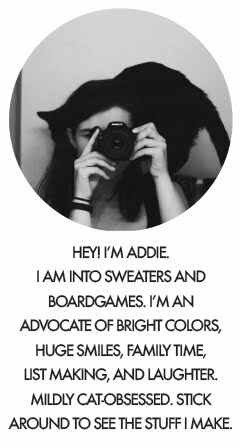 Also, did I mention that I love your new blog layout? The header is adorable. Florals, I'm in love! what an adorable dress. i would absolutely love something like that. glad i found your blog! your taste is lovely.